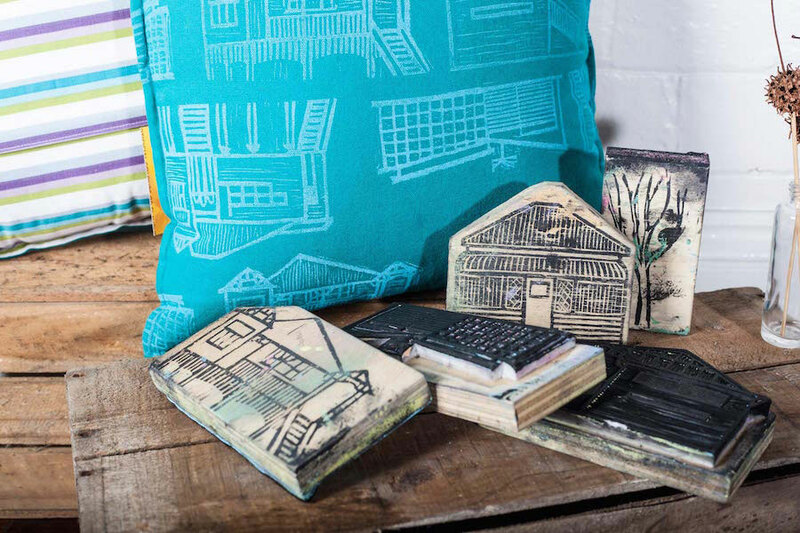 Image features print blocks and cushion – screen printed and made by Little Brown Dog Workshop. Image credit photographer jason mcnamara. We chat with Bec Lewis, the creator and maker behind little brown dog workshop, a small business doing big things out of Ipswich, Queensland. Bec’s unique designers were enough to win us over initially, and now we know more about her sustainable practices, we just can’t get enough! Read on to discover more and head to our Brisbane market to shop direct from little brown dog workshop. I guess it all began when I was twelve and attended a school holiday screen printing session because I’ve loved it ever since. There’s nothing like the thrill of lifting a screen to reveal the print below and witnessing the transformation of a plain piece of fabric into a unique hand printed work of art. Informed by a thrifty and eco-conscious upbringing and a degree in Environmental Management, I aim to bring best environmental practice to my work. 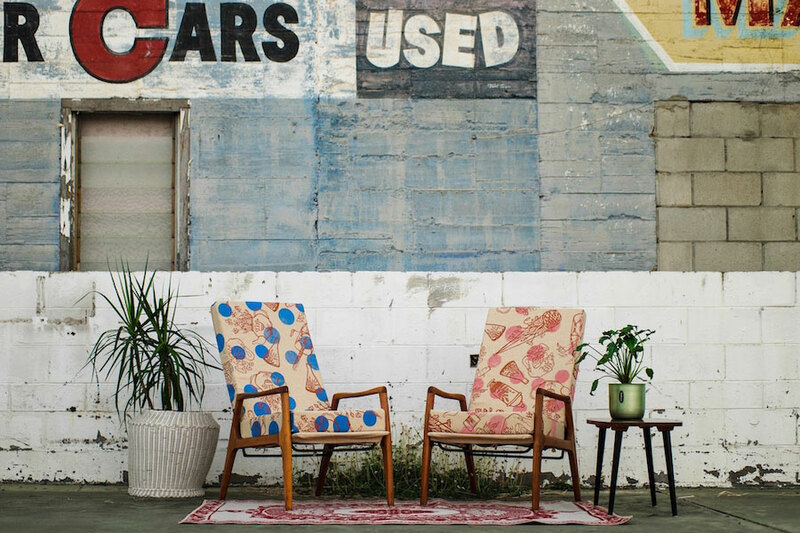 I use Australian made, water-based inks, vintage and pre-owned fabrics, salvaged timbers and furniture and 100% recycled PET bottle cushion inserts. Where I can’t source second hand, I shop small and local. 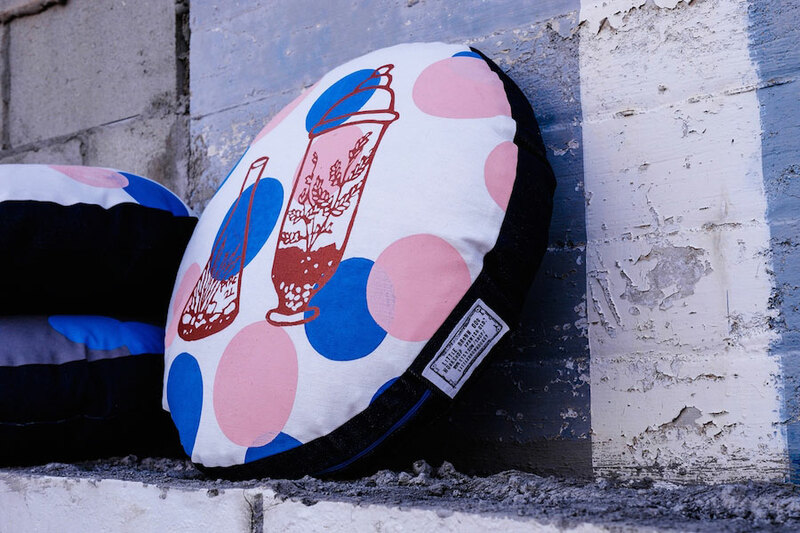 Image features windowsill pink and blue cushions – screen printed and made by Little Brown Dog Workshop. Image credit photographer kim wheeler. Bring a friend! Someone who knows you and your work well, who can help with sales and packing and who you can happily leave at your stall while you take a lunch break and more importantly have a wander round to check out the other fab stalls. Tell us something exciting that you have planned for little brown dog workshop this year? We’ve just moved into our very own studio space, which is super exciting. It means we can set up a long table to print fabric meterage plus we have a lovely spot to host workshops and creative events. Along with the ‘windowsill’ collection featuring indoor plants, terrariums and kokedama which we’ll be showcasing at Brisbane AW16 Finders Keepers in July, we have a couple of other small collections in the works including ‘small change’ featuring Australian coins and ‘munted peaches’ featuring a selection of ugly fruit and veg. They are so far drafted and block printed and the next step is to get them set up on screens so we can get cracking with more fabric printing. 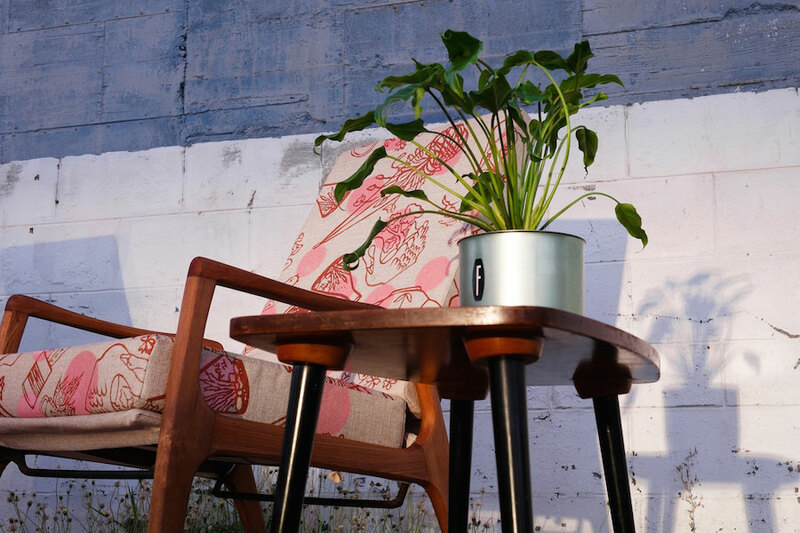 Image features windowsill chairs – screen printed and made by Little Brown Dog Workshop. Image credit photographer kim wheeler. Printing ink!! Specifically – Permaset fabric ink. 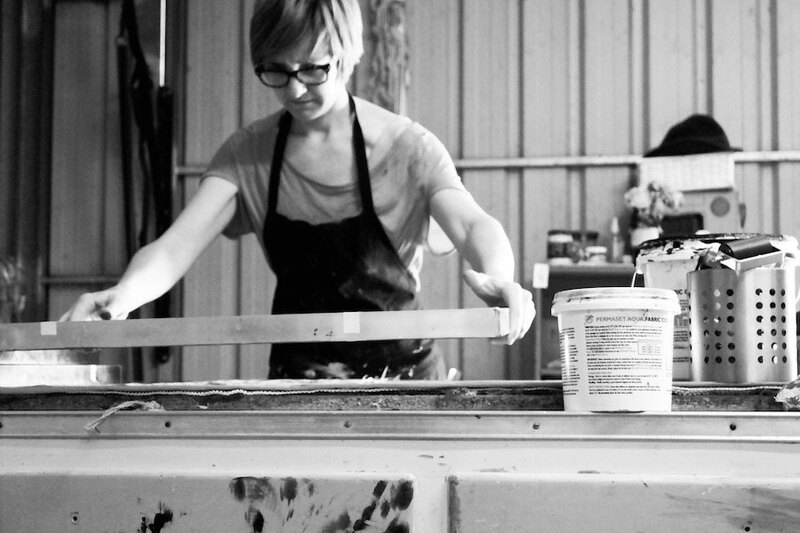 I’ve used Permaset since I learned to screen print when I was twelve. I love the standard colours, that I can mix my own custom colours and most importantly that it is water-based and eco-friendly, this is especially significant as we do a lot of printing with and around our kids. 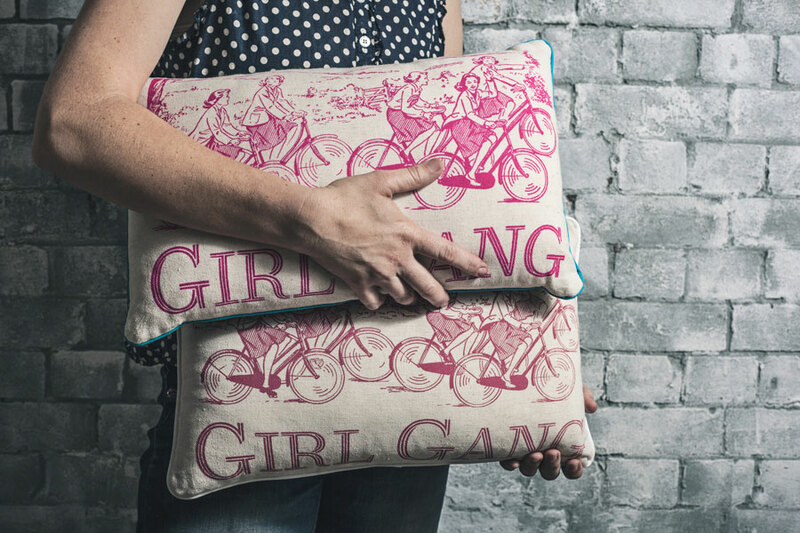 Image features girl gang cushions – screen printed and made by Little Brown Dog Workshop. Image credit photographer jason mcnamara. This is a really hard question so I’ve chosen my most recent favourite – our new ‘girl gang’ cushions. For me this product represents everything we are about as it’s the perfect mix of old and new – a new catchphrase on a vintage image, discarded linen revived with a hot pink print and transformed into a fun new cushion with pre-loved denim backing. Plus it’s a true representation of the two creative minds working behind little brown dog workshop. 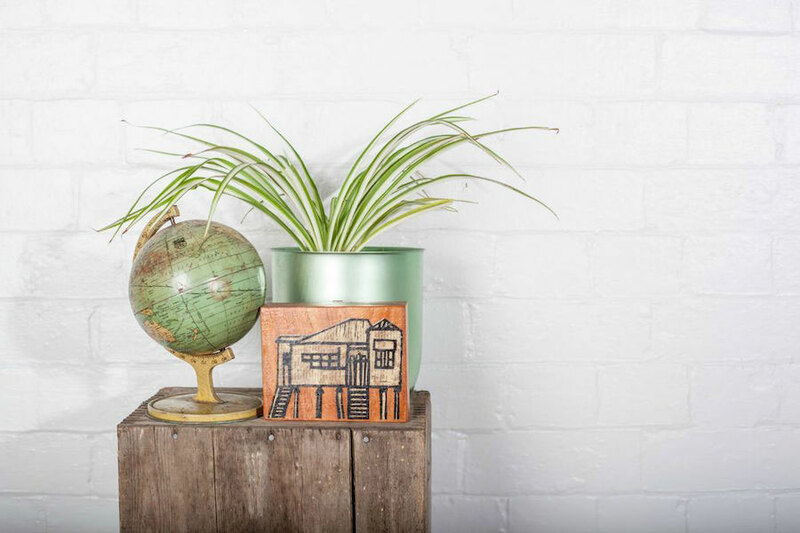 Image features House Block – screen printed and made by Little Brown Dog Workshop. Image credit photographer jason mcnamara.